Now I love making a scrapbook page more than the vast majority of the population, but making a layout that really feels like something new and exciting? Those are the moments that feel like ACHIEVEMENT UNLOCKED. Next level crafting that reminds me of the joy I find in memory keeping and in creating pages, from the photos to the stories to the pretty paper. I’ve always found it’s way too overwhelming to think about developing my crafting style by looking at all the elements at once. Instead, I go through seasons where I really focus on improving my photography, and times when I really write and draft to get the words just how I want them, and days when it’s all about where things can go on the canvas of a page, and times when I want to try every new embellishment technique I can find. So it makes perfect sense to me that the way we can level up is to take the time to look at each of those things closely. Just imagine the level of Achievement Unlocked it will feel when you put all those things together on your pages! I hope you’ll join me in class and level right on up! Level Up starts Tuesday the 5th of March 2019, and includes four weeks of class materials in video and printable PDF formats. We will focus on one specific topic each week and you’ll identify your strengths, joys, and challenges at the beginning of the week and follow steps to improve your skills and make it all easier: levelling up! Those four topics are photography, page composition, writing, and embellishment. Photography: join in with your phone, point and shoot, or SLR camera. We’ll be looking at portraits, still life, and scenery, and you’re welcome to try all three or choose one to really bring it into focus. If you will be shooting on a DSLR camera, I would suggest reading through the Camera School section of the blog first, so we can go beyond those points in class. Page Composition: how many photos and where can they go on the page? We will look at both single and double page layouts (and a tiny look at pockets alongside full pages) and where things can go on those 12×12 pages. I really do believe there is a page design for every occasion, so we will look for that right occasion for everything from a single photo layout to more than a dozen photos from a single day. Writing: after I’ve done the pretty stuff, I’m supposed to journal too? You might already love to journal or you might currently be aiming to just get a name and date on the page. Either way, you can level up. We’ll explore different ways to find your own voice and make the writing feel just right. Embellishment: then the pretty stuff to close! We’ll try different techniques with different supplies you have on hand – and there will be things to try if your stash is limited and things if it’s really, really not. I even went out and learned some new techniques I had never tried for this topic, so I am excited to see you put your own spin on those. If you have a annual pass from 2018, this class is included and will appear on your class list when the forum opens. No need to do anything else. If you don’t have an annual pass, you can sign up for just this course in your choice of currencies: $30 US dollars or £23 UK pounds. If neither of those is your currency, you can choose the one that is best for you. Once you sign up, you will receive a PayPal receipt email confirming your completed payment. The forums will open next week, and when that happens you will also receive an email from me welcoming you to class. Any questions, just email me. I’ve just arrived in Phoenix for this year’s Creativation Trade Show, where I’ll be debuting this new collection coming this spring: Sparkle City! After all your love for Glitter Girl, I’m excited to share this vision of Glitter Girl’s world: a city of colour and creativity, where everyone can be a superhero. Please pop over to the American Crafts blog to see more of the collection today, and follow along on Instagram and Facebook as I share projects and products direct from the show floor throughout Creativation 2019! I can’t wait to see what you make with Sparkle City when it hits your favourite crafts stores this March. 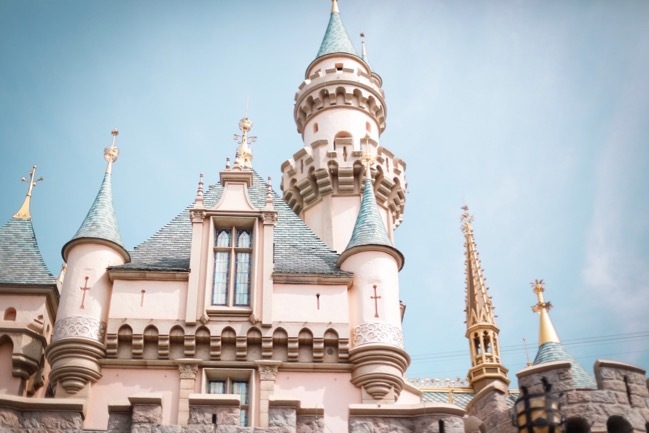 Join me for a day of creativity at the Disneyland Resort in Anaheim, California! 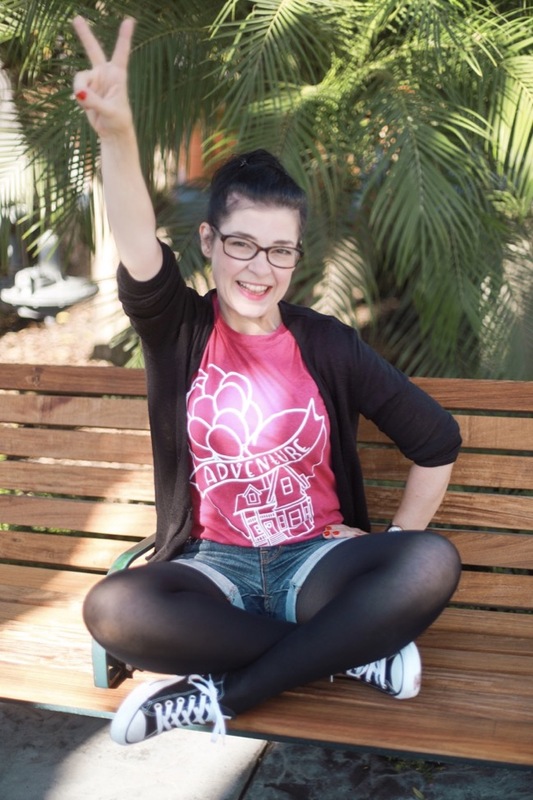 Disneyland absolutely fuels my creative fire, and I would love to share that with you! After a few light-hearted discussions on Facebook, I’ve made a schedule and worked it out to really happen! I’ll be ready with pens and songs and the biggest smile I can find! 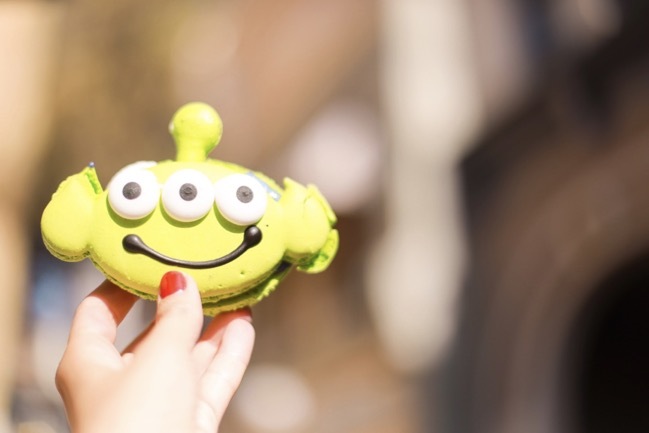 We’ll start the day bright and early with a special breakfast together, then hit the Disneyland park with a creativity-driven itinerary. Bring your camera of choice, be it your phone, Polaroid, compact camera, DSLR, or something with film. We’ll be spending a big part of the day gaining confidence both behind and in front of the camera, in my very favourite place to take pictures! That includes daytime photos, golden hour portraits, and some other special subjects. It’s too early to know if there will be a night parade or firework celebration that day, but if there is, we will make the most of it! We’ll also have a very relaxed group photo shoot with a local photographer. After the day, we’ll share all the photos from each of us, so you’ll have plenty of scrapbook gold to remember the day. We can’t have a traditional scrapbooking workshop inside Disneyland park, because scissors and security don’t mix, for starters. 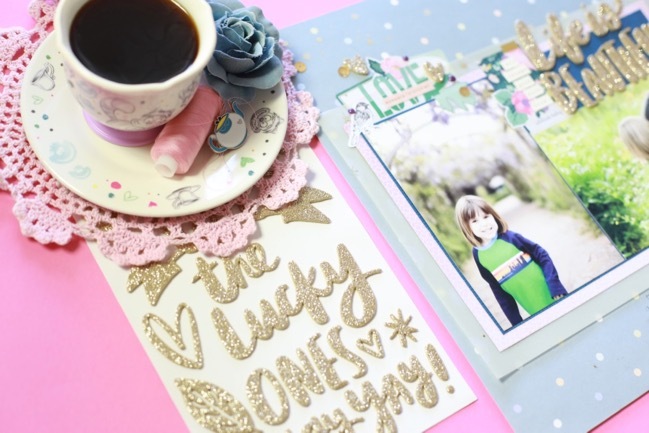 But a special kit of scrapbooking supplies is included for you to take home, and you’ll be able to share what you make with the others from the group in our online chat just for everyone attending. Lunch, dinner, and snack breaks are scheduled in, but you are welcome to eat with the full group or take a break to head out on your own. Breakfast is included in the price. If you have dietary restrictions, please don’t fret, as Disney cater so well for food needs. (We test this regularly, since my son and I both have food allergies and they aren’t even the same foods!) Just let me know so I can make any needed notes to our reservations. If an open to close day at Disneyland is just far too long for you, I encourage you to join us from the start of the day and head home when you feel it’s best. That will be much easier than trying to join us midway through the day. There are just twenty spaces available, in order to keep the group to a size that will let us all make new friends but not be overwhelmed or feel lost in the crowd. If there is more interest, I will open a waiting list in case anyone has to change their plans. A Day of Creativity is $185, with $100 due on registration and the remaining $85 due any time before the 31st of December 2018. It includes a special table service breakfast, exclusive scrapbooking kit, and all the photographs from the day. It does not include park admission, additional food and drinks, or any hotel you might need. If you are not an annual pass holder and would like assistance booking your tickets, I’m happy to help with that. Just to clarify, this is at Disneyland in Anaheim, California! If this event goes well and there is interest in something similar at Walt Disney World or Disneyland Paris, we’ll see what we can arrange in the future. Thanks ever so much for your interest and I look forward to seeing some of you soon! 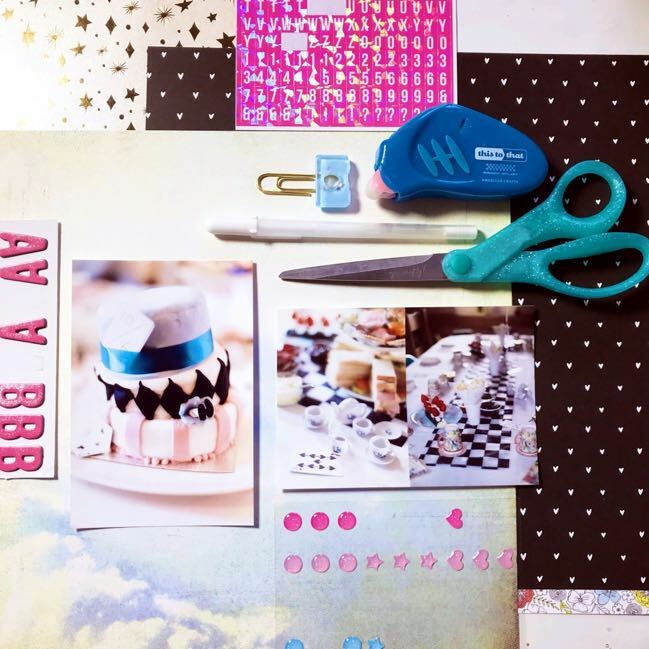 Behind the Scenes Scrapbooking: a New Online Class with a Twist! I love the story involved in scrapbooking – as you may have noticed – but it’s not just a single page story that truly has my heart. It’s that ‘book’ element of ‘scrapbook’: telling a detailed story, page by page, all contained in an album. 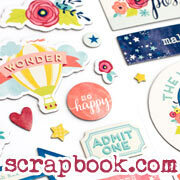 That is what brings me my biggest scrapbooking joy! And yet I create just one page at a time, and you might see one of those layouts on Facebook Live and another on YouTube and a few more in a class demonstrating a composition technique and a few more posted on Instagram. So how do they all come together to create that book I love? With a bit of planning behind the scenes. My next class will show you this specific process in real time: I start with all the photos from Summer 2018, and I go through what has always been a more ‘behind the scenes’ process for me. That includes choosing which photos, how many pages each event will get, editing the photos, ordering the prints, gathering the supplies for each page, and working out how they will flow in a chronological album. I’ve offered two classes before that focus on my album process (Cover to Cover and Most Magical Scrapbook), but I’ve never covered my current photo editing process, how I cover my dining table in supplies for a day just to see what works together, or how much drafting I do for journaling. You’ll find all that and more in this Behind the Scenes workshop. Here’s the real twist though: six of the class videos will be presented live, so you can watch and participate if you would like. You can also watch a recorded replay if you can’t make the live times and you’ll be able to post in advance with any questions you know you want to ask if you will be waiting until the replay. While I will be answering questions throughout the live videos, this won’t be the off-topic discussion we often have on Facebook Live – each of the live videos has a specific topic to cover and we’ll discuss it in depth. After watching the Behind the Scenes class videos, you’ll have a whole new understanding of what I’m working on when I create pages for any other format – you’ll see those exact planned pages come to fruition on Facebook Live, in YouTube videos, and other pages posted here. Though not to worry – you’ll see several pages made in the class videos themselves, so you’re getting a mix of the planning and the page creation through the class as a whole. 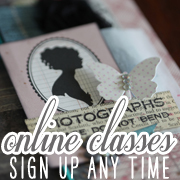 Class begins on the 30th of October, so you can sign up any time before then to get the best potential for interaction, including discussions during the live scrapbooking videos. Class registrations are not instant and are processed by hand. If your PayPal email address doesn’t match the email you’d like to use for class or more than two days goes by without receiving access to the class, please drop me an email. If you are a 2018 annual pass scrapbooker, this class will automatically be added to your account once the forum opens. I hope to see you soon, so we can go behind the scenes and put a plan in action for scrapping whatever might be on your to-scrap list! Pre-order your 2018 Christmas in a Box kit and stamps! Hello October! This brings my one little slip when I must start talking about Christmas before November – this week is the time to pre-order if you’d like a 2018 Christmas in a Box kit or any of the stamps! Full kits, including papers, embellishments, and stamps, can be posted from the UK or USA, or the stamps are available separately if you prefer to use your own Christmas stash with just a little something new. Pre-orders end this Sunday, the 14th of October. …and this is the number sheet. 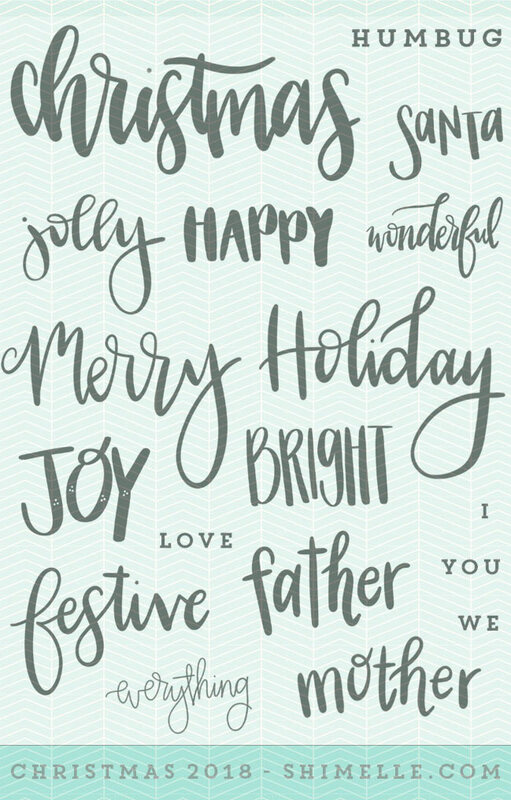 These are 4×6 inch stamp sets and are both included in the full Christmas in a Box kit. They can also be purchased as a set without the kit, if you prefer. 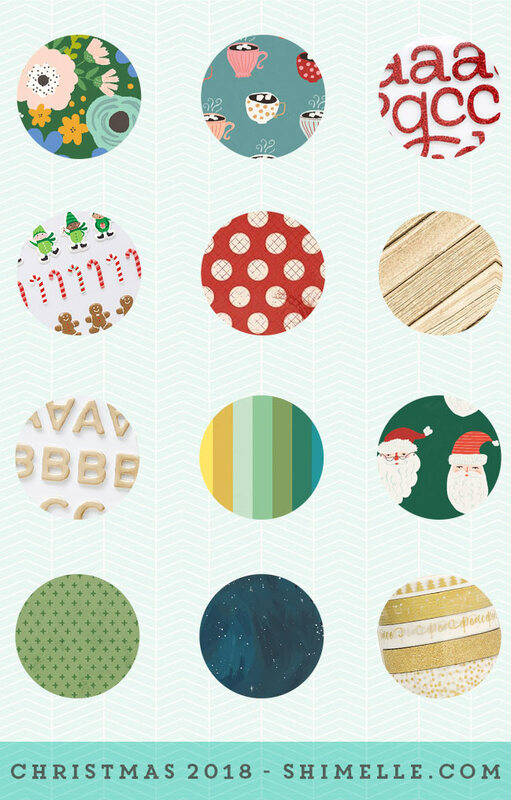 Or you can opt for the full Christmas in a Box kit! Here’s more of what you’ll find packed into Christmas in a Box: lots of 12×12 paper, with a range of lush greens balanced by white-background prints, plenty of red, with navy, gold, and a little splash of the rainbow. 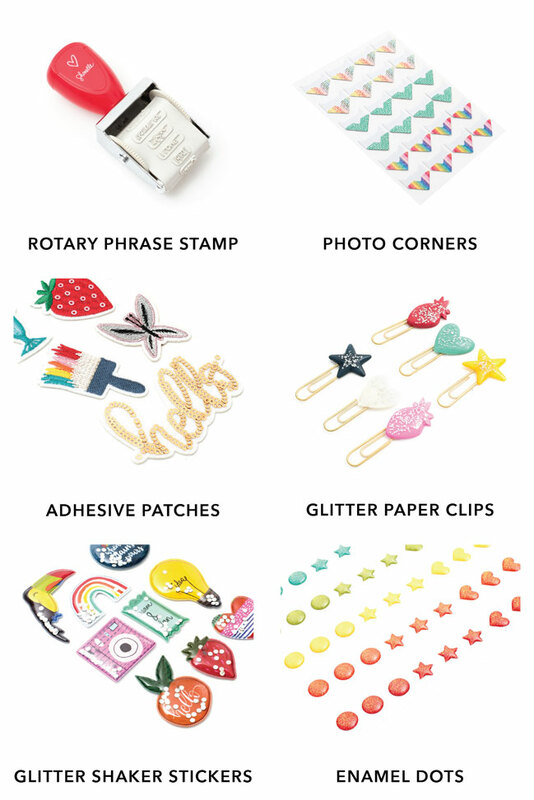 Plus Thickers in red and gold (in a font that works well on small projects too), vellum, washi tape, flat and puffy stickers, and of course the custom stamps. New for this year is a subtle writing pad to give you plenty of options when including stories short and long or creating your own titles. 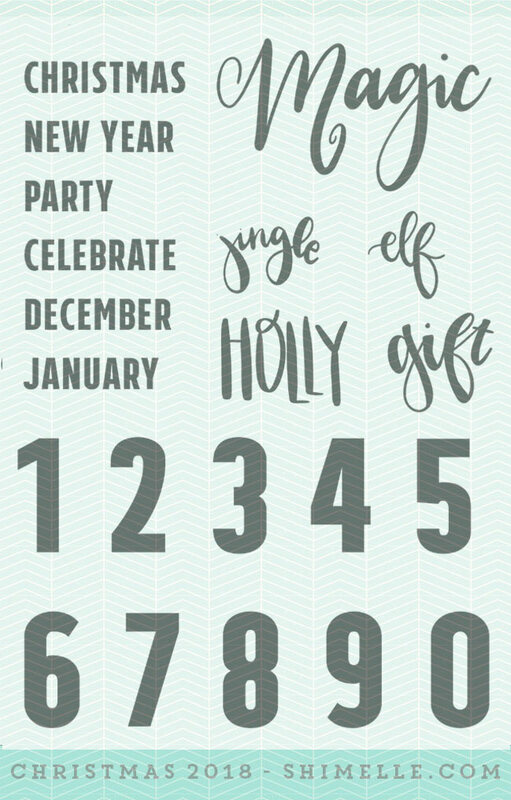 Everything is chosen for a mix of specifically Christmas things alongside patterns that can be used year-round for the everyday. This way you can incorporate your leftover supplies into your stash in January without building up year after year of supplies you only use at Christmas. Kits ship from the UK and the US, so if you are in the US, your kit will ship from the US and and if you’re in the UK, your kit will ship from the UK! If you live somewhere else, we will ship your box from the location that is most affordable, and additional shipping will be billed at the cost from the postal service. From the UK, this about £10 for Europe and £15 beyond Europe for the full kit, to give you an idea. When you pre-order, you pay a deposit of half your kit price now and the remaining half when your kit is boxed and ready to ship. For UK addresses, that’s £20 now for a total kit price of £40. For US addresses, that’s $25 now, for a total kit price of $50. Those prices include shipping. If you would prefer to pay your full balance now, that’s fine of course! (This is great if you are travelling or busy at the start of November, when the balance invoices will be sent!) Any boxes paid in full will ship immediately when everything has arrived. 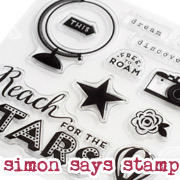 If you have plenty of Christmas stash and would just like this year’s stamps, that’s available too. The set of two sheets – words and numbers – is $24 or £18, which includes postage anywhere in the world. Again, choose if you want to pay the full balance and they will ship automatically or pay the deposit and I’ll invoice you for the remaining half before they make their way to you. All stamps ship from here in London, but they travel pretty quickly by airmail. Pre-Orders have now closed. Thank you! A very limited supply of kits and stamps will be available without placing a deposit, but those numbers are truly very few. If you would like to reserve a kit with no worry, pre-ordering is your friend. If you have any questions, please do not hesitate to email me and I’ll help in any way I can. Thanks so much, and I promise you can now go right back to autumn and not think more about Christmas until at least November! Layering pretty paper is my all at once my oasis of calm and my jump of excitement. There seems to be something about the more years of scrapbooking I rack up, the more layers of paper end up on my pages. This autumn marks twenty years of making pages for my own albums so we are getting to a fair number of layers now. I’m not delighted with a page until there’s layer on layer on layer… and all the rest. If you love paper layering or wish paper layering happened easily for you, then I know you’ll enjoy the new class I have coming up oh so soon now: Layer on Layer on Layer… It’s a six week class with thirty layouts shared from start to finish in thirty videos, each also accompanied by a PDF with still pictures and summary notes to recap the video lessons. We’ll look at layering with colour, with specific products, with sketches, with inky techniques, with extra photos or lengthy journaling. Most importantly, we’ll look at how layering works with your style. It is never my goal for you to create carbon copies of my layouts in my classes. Instead, I aim to give you ideas you can adapt and personalise so you create pages you love. Class starts Monday the 2nd of July and finishes Friday the 10th of August, 2018. Though this is the time frame when the class materials are posted, there is absolutely no pressure to work within that time frame. There is no such thing as ‘falling behind’ in my classes. Everything includes permanent access to the materials and you’re encouraged to work at your own pace. Class videos can be watched via streaming online video or be saved to your own device to watch offline. You’ll receive an email each time a new video is available, with the PDF file attached and a link that takes you to the private class form to watch the video. It’s also the place where you can chat with other class participants, share photos of what you make, and ask any questions. I’m also available by email, and should your questions come after the end of the live run of Layer on Layer on Layer… just email me and I’ll help in any way I can. The annual pass for 2018 is still available and would also include Clear the Desk, a new class that ran earlier this year, which you could work through at any time that suited. The early bird price of $30 or £23 if you sign up this weekend – before the end of Monday the 25th of June. Early bird pricing has ended, but you can sign up any time for $35 or £27. Choose whichever currency you prefer – US dollars or UK pounds. Please realise class registrations are processed by an actual person (me!) rather than anything automatic. By signing up, you are confirming you’re happy to receive emails for this class. I confirm I never share or sell class emails and I don’t email you for things other than the class. Okay, time to sign up now! If you have any questions, don’t hesitate to send me an email. See you in class so soon! 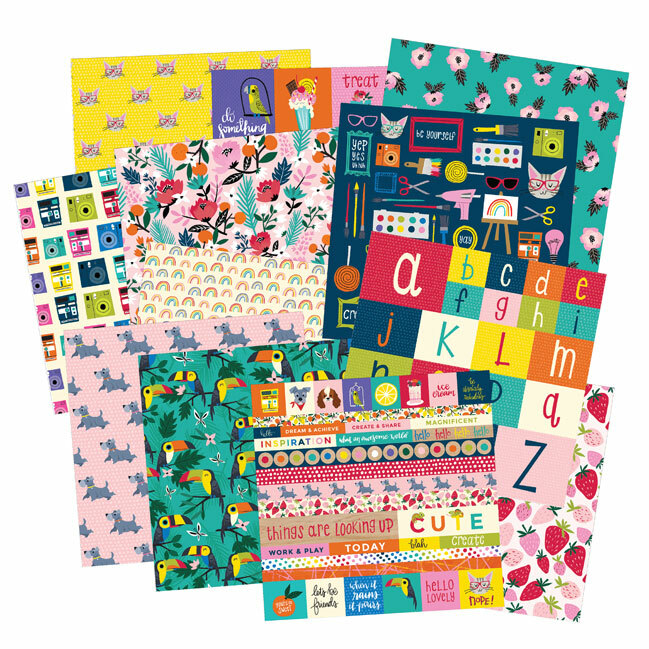 With all the fun of Creativation just finished, thousands of beautiful new papers, stamps, and embellishments are on their way to shops and then to your hands. But if I’m honest, I still have a few things from last year’s new releases sitting on my shelf, just sitting and looking pretty. It’s time for them to do something! 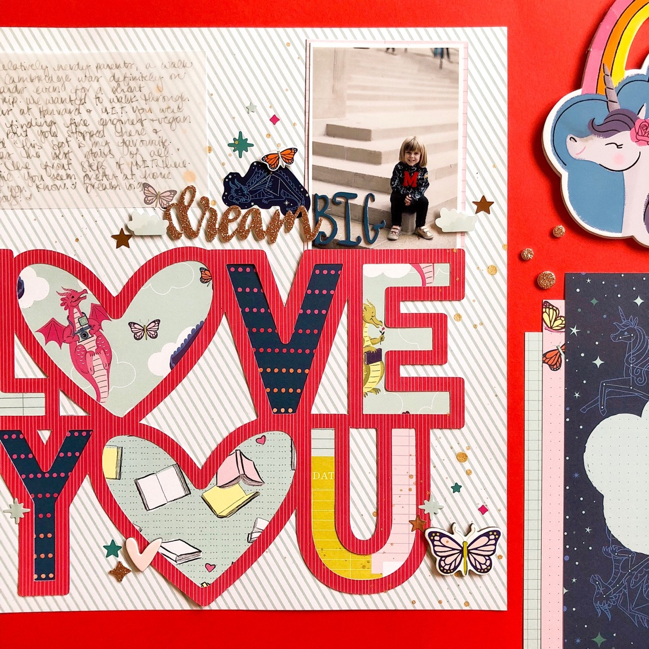 And the time is now, so they can have their moment of glory on a beautiful new scrapbook page before brand new products arrive and eclipse my older favourites. Clear the Desk is a short online class to help with just this. Through a series of eight videos, we’ll gather our supplies and create new pages with a focus on using patterned paper, stamps, and embellishments. 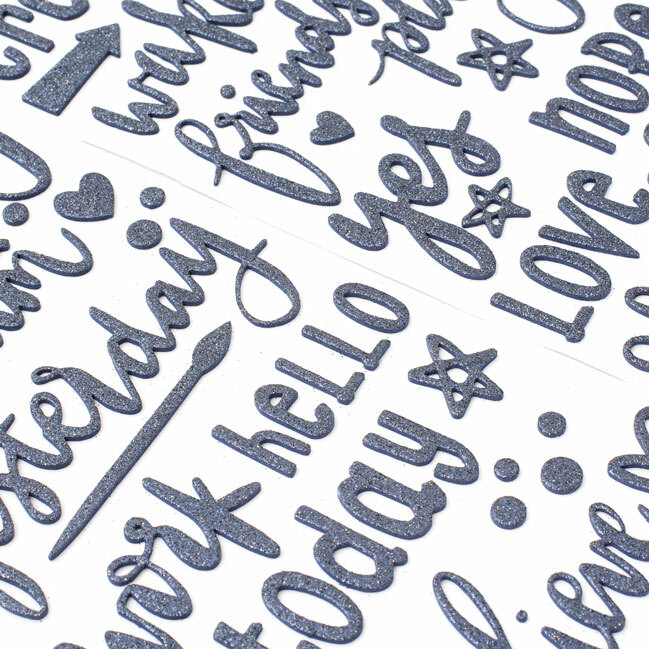 (If you are not a stamper, you can opt for more stickers and other embellishments; likewise you can stamp more and use fewer premade items if that’s your style.) The example layouts feature a variety of photos sizes, including mini prints, 4×6 prints, and A4 enlargements. Most of the examples are 12×12 single page layouts but there is one two page spread and one pocket page as well. 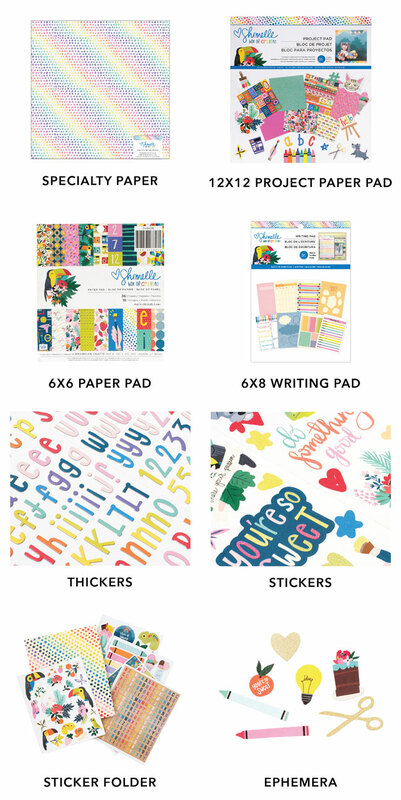 You are welcome to use any supplies you have to hand and the aim is to not do any shopping for this class – that way you’ll be making room to welcome your new supplies! If you are a kit club subscriber, you’re welcome to use one or more kits to follow along. If you buy all your supplies individually, the very first video will walk you through the gathering stage of this process so you can choose what you want to move from your stash into your albums! Class begins Tuesday the 20th of February 2018 and runs two weeks until the 6th of March. You can, however, sign up at any time to access the class materials. If you would like to participate at the same time as others, then join in now for the live run! Clear the Desk is just £10 or $15, but for the first time I’m also offering a year-long class membership should you wish to automatically join in all the classes I teach throughout 2018. The 2018 class pass is £100 or $150, which is less than the total of all my new classes for the coming year. Should you not already be signed up for the annual classes Learn Something New and Journal your Christmas, these would also be included for further savings, but they are not including in that total of ‘new’ classes – just an extra bonus if you haven’t already sign up for those. I realise the annual class pass is not the right option for everyone and I will always offer every class individually, but I’ve had some of you request this option for several years and it seems the best time to give it a try! This offer will only be available until the end of February 2018, and then will close and classes will be available individually. If it helps with your decision, classes on the schedule for this year include layering, choosing colour combinations, journaling, page composition, and photography. Some classes are longer and more in-depth and others are a shorter two week format like Clear the Desk. No matter how you sign up for any of my classes, you have permanent access to all the class materials. There are no deadlines and you can work on any schedule that suits you. Do be careful to choose the option you want, of course! Access to all shimelle.com classes for the whole of 2018: £100 or $150. Or sign up for just Clear the Desk on its own: £10 or $15. I’ll talk more about Clear the Desk between now and the 20th, when we get started, and of course you can email me any time with any questions and I’ll help in any way I can! Have a great day and see what’s still sitting on your desk! I hope to see you in class soon. When I need to rediscover my creativity, I do three things. I listen to the score from Amelie on repeat. I go to the V&A. I buy a new box of crayons. Somewhere between the sound of the piano, the colour of the museum, and the smell of the crayons, lies my reset button, and it is a very powerful thing in my life. But it’s a life I refuse to take too seriously. Enter Box of Crayons, my shout out to crafters that I understand the need to make things, the need to use all the colours in the box, and the need to order the milkshake that comes topped with candy floss and a lollipop just to see it on your table. Let’s make stuff, okay? This collection will debut in full this weekend at the Creativation trade show in Arizona, but my first samples of some of the products arrived today and I’m allowed to give you a look. I shared everything straight out of the box today on my Instagram Stories, so you can see some products there. You can also see more on the American Crafts blog. Here’s a look at all of the papers, a and b sides, and the three paper pads: 6×6, 12×12 project pad, and the 6×8 writing pad. 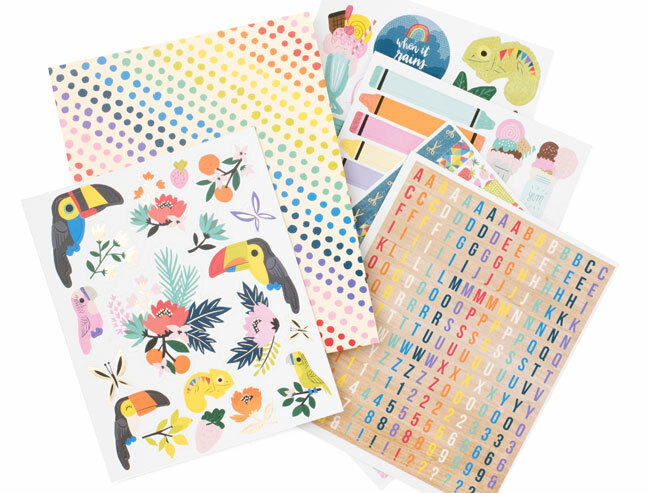 Box of Crayons is scheduled to ship to stores from the 19th of February, so I hope you’ll enjoy cutting and sticking with all things bright and colourful all spring and summer this year! There will be plenty of projects to share as I get a chance to cut into all those papers, and can’t wait to see what you make too. If you share your projects on social media, please add the hashtag #ACboxofcrayons and tag me so I don’t miss your creative genius! Because you know that thing where you open the fridge to see if there’s anything you want when you know full well the contents of said fridge? I open my Thickers drawer at least six times a day looking for navy blue. And there is never navy blue. BUT NOW THERE WILL BE. I’m a little excited about that. That and new boxes of crayons. Stop and say hi if you’re at the show this weekend!